Is Racism Still a Thing? “Why do you talk about racism?” That’s the question I was asked by a man who had told me he was looking around for another church. “Racism may have been a problem in your day, but we’re over it today,” the 30-something claimed. “In your day” is kind of an “ouch” phrase, but I appreciate it. I don’t want to be guilty of bringing into the present the problems of the past. Before you answer, read what happened to me last week. I was at Sam’s Club in the fresh fruit section. A food sampling stand made the aisle really narrow and crowded. A narrow aisle and a wide cart. And, I didn’t park my cart very well. It was sticking out into the aisle a bit. Two African American ladies, maybe mother and daughter, were pushing their cart toward me. I smiled at them and said, “Hey, how ya doing?” while pulling my cart closer to the fruit display to make room for them to get through. You need to know that in the section of the cart where we used to set our kids, I now set my “man-bag.” Yes, I carry one. That’s a topic for another post. Another shopper passed by, leaned over to me, and said, “You were smart to protect your purse,” and kept right on walking. Moving my cart, to her, was “smart?” Really? That’s why I talk about racism. Racism is not a thing of yesterday. It’s a thing today. Let’s be shocked by the labeling we see and the labeling we do. Whenever we’re labeling, we’re not seeing. Let’s come to our senses. Let’s challenge ourselves and others. Yes, that was “back in the day” – 1970 or 1971. We needed it then. We need it now. One thing I did to honor Martin Luther King Jr. this weekend, was to take a test: The Implicit Association Test. The test is designed to reveal how we really feel about certain topics. The test-taker can pick from 14 topics. I picked “Race IAT”. The test took about 5 minutes. “Are you a racist?” is a question that’s been in the news the last few days. It’s a good question – a question I needed to ask myself, not just someone else. Really? That’s terrible! That’s not what I expected – at all. Maybe I’m just a bad test-taker. Maybe I didn’t understand the questions. Maybe it’s a bad test. Or maybe the test is accurate and I’m not as unbiased as I thought. That’s me. I didn’t want that evaluation. I didn’t like my test score. There have been a lot of test scores in my education path I haven’t liked. But these results mattered more. They hurt. Well, that stinks. I’m not going to accept that. If I need to change, I will change. “Old things have gone away, new things have come!” (2 Corinthians 5:17). That’s hopeful! “Everyone thinks about changing the world but no one things about changing himself.” Leo Tolstoy That’s challenging. No one comes out of the womb a racist. No ones born harboring hateful, prejudicial thoughts or views toward others. But, that baby grows up, and like a sponge soaks up the liquid into which it is dipped, children soak up the attitudes and perspectives of those people into whose lives they are submerged. It was gracious of Dr. King to chalk up the hateful, racist, murderous views and actions of people to their upbringing. “Take my yoke upon you. Learn of me because I am gentle and humble in spirit…” (Matthew 11:29). Jesus invites me to learn a new way. It is the way of my identity in God – my “true self” – Thank you Thomas Merton. The way of gentleness and humility, the way of love. God creates us in God’s own image. Take a moment to let that sink in. That’s big. Teresa of Avila says our soul refers to our God-given godly nature. Our God-given godly nature is the infinite reality of us. Since God’s essence is love (1 John 4:8), we are love. Let’s learn to live out who we are – to live out love. And then let me take the test again. “If you can’t stand the heat, stay out of the kitchen.” Paula Deen’s kitchen is pretty hot these days and some of her business partners are getting out. They’re dropping her like a hot sweet potato covered in melted marshmallows – Ok, enough of the corny metaphors. The situation with Paula Deen, along with the Trayvon Martin/George Zimmerman case in Sanford, Florida and the Supreme Court’s action on “Affirmative Action” and the Voting Rights Act this week, and the protest of a Cheerios commercial showing a bi-racial couple, show that race is still an issue in 2013. When Matt flat-out asked if Paula was a racist, she answered definitively, “No. No I’m not, no.” I believe her, in that in her own mind, she doesn’t believe she is a racist. In her eyes, she is not. Honestly, I don’t think Paula hates black people. But her testimony in the deposition and other comments recorded on video indicates at least an insensitivity. And wishing she could plan a “southern plantation wedding” for her brother, with African American servers in the part of slaves. My point of this post is not to “pile on” Paula Deen. I have some experience with people talking about me in ways that misrepresent me and my views so I am sensitive to that issue with others. I respect her request of America to “not throw stones.” While it’s easy to point a finger, I realize that there are three fingers pointed back at me. I wonder if we like Paul Deen type episodes. They allow us to focus our attention on the splinter in the eye of someone else while ignoring the log in our own eye. My point is to ask the Lord if I am blind to any behaviors or attitudes that are insensitive and/or offensive to people. I just fixed some hot tea. Love it. The tea in the bag was diffused in the water – effortlessly, completely. I think that’s what happens with prejudice. It seems to infiltrate our hearts and culture – sometimes silently. Psychologists talk about “symbolic racism” – instances of individuals using code words that tend to indicate racial prejudice without being overtly racist themselves. For example: If you’re complaining that you aren’t allowed to use the N-word while other people get to, you just might be a symbolic racist. 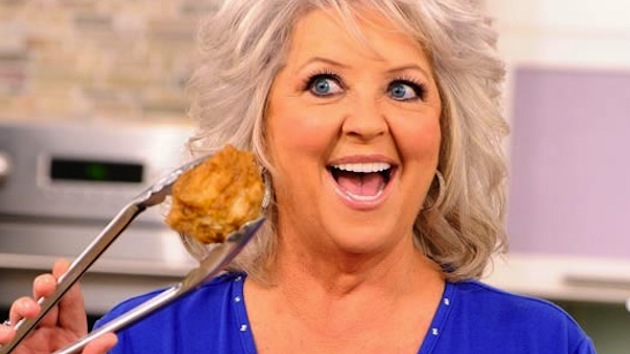 I’m not a Paula Deen food fan. I don’t put mayo on my corn on the cob. We have none of her cookbooks in our home. We don’t use her recipes. I think she’s a nice person and I believe her when she says “I have never intentionally hurt anybody on purpose, and I never would.” She is learning, and I hope I will as well, to know and avoid what hurts people.